A unique new shark spotting app will make swimming safer for Cape Town’s water babies. 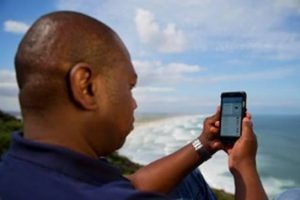 The app, which smartphone user can download free of charge, gives real-time information about shark activity at beaches, safety tips to reduce the risk of encountering a shark and information about shark activity in Cape Town. It also gives information about marine activity in the area (such as whales, seals, dolphins, sunfish etc), weather conditions and amenities on the beaches. 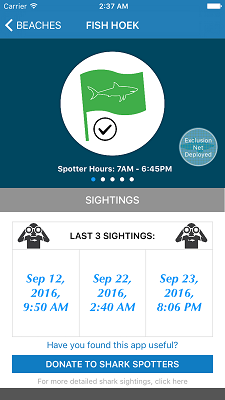 The shark spotters app can be downloaded free of charge. Poor spotting conditions due to cloud cover. An indication of water temperature. An indication of whether the shark exclusion barrier in Fish Hoek has been deployed or not.